Answers to “What it really takes to Top JEE-Main?” must be sought from the topper Pramod Vakacharla himself who is currently riding high on his unprecedented achievement. The guy scored unbelievable 355 marks out of 360 to outsmart whopping 13 lakh JEE-Main candidates from across the country. Believe it or not! This means that the guy had answered only one question incorrect. The prodigy prepared rigorously for 11 hours every day and barred himself from all social networking sites to be on the top-most slot of achievers. For his success, He gives credit to his determination, hard-work, and support from his family members. He scored 120 in both mathematics and chemistry and 115 in physics. 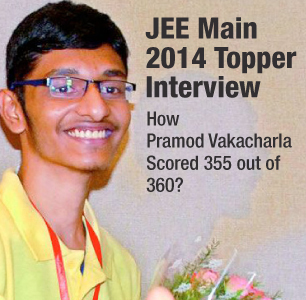 Pramod had only one incorrect answer in the JEE-Main 2014 Examination. “Fortunately, I could do all questions in the paper except one question in Physics. Actually, I knew the right answer to that Physics question also, but marked the wrong bubble in the OMR Answer sheet,” Pramod said during an interview. In his practice papers, he was scoring 320-330 regularly but bagging the title of a ‘Perfect Scorer’ was completely unexpected even for him. Since his favorite subject is Chemistry, the questions from the subject in the examination were easier than other subjects. He finds Physics difficult of all subjects while Mathematics is of average difficulty level for him. Although he has not taken JEE-Advanced 2014 yet, he wishes to study Computer Science Engineering (CSE) from IIT-Bombay. An avid fan of Hollywood fan is eagerly waiting to get done with JEE-Advance 2014 so that he can watch Hollywood action flicks. His all-time favorite movie is Fast and Furious. « Are Modern Einstein Better Than The Real One! !